The ECPR offers a wide range of courses at the Summer School in Methods and Techniques. All designed to ensure you can get up to speed and begin your research with confidence. Led by Laura Sudulich (PhD – Trinity College Dublin), a Research Fellow at the Université Libre de Bruxelles, Internet-based Socio-Political Data provides an introduction to digital social science research. Firstly, it addresses challenges and opportunities researchers face when studying Internet based or internet-related social phenomena. Secondly, the course focuses on methodological and design issues related to the particular structure of online-based data. Thirdly, it presents an overview of current research in this area. It provides the theoretical knowledge to pose research questions, formulate working hypotheses and select appropriate data. Various forms of online data collection will be reviewed and an array of suitable analytical techniques will be outlined. Examples are readings and digital materials are selected from different disciplines within the social sciences. Participants are encouraged to bring their own ideas, projects and questions to make the most out of interactive sections. Who should attend the Internet-based Socio-Political Data course? Internet-based data are extremely rich and increasingly used in other disciplines but few people in political science have any idea of how to collect it. 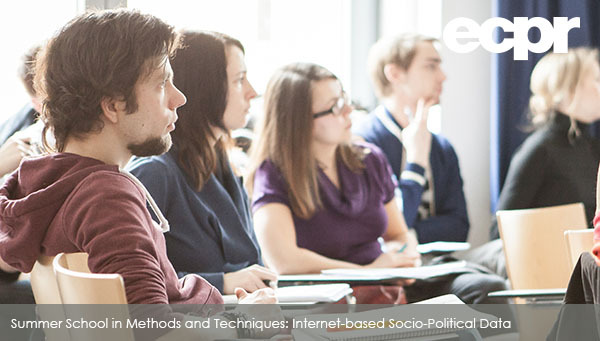 This course is therefore vital training for political scientists who are interested in using internet-based data in their research. How do I register for the Summer School? For further details about the course list including Internet-based Socio-Political Data, please click here. Further information about course fees, ECTS credits, and Ljubljana itself, please visit the Summer School page here.